Previous Article Hogmanay toast to Johnnie Walker! 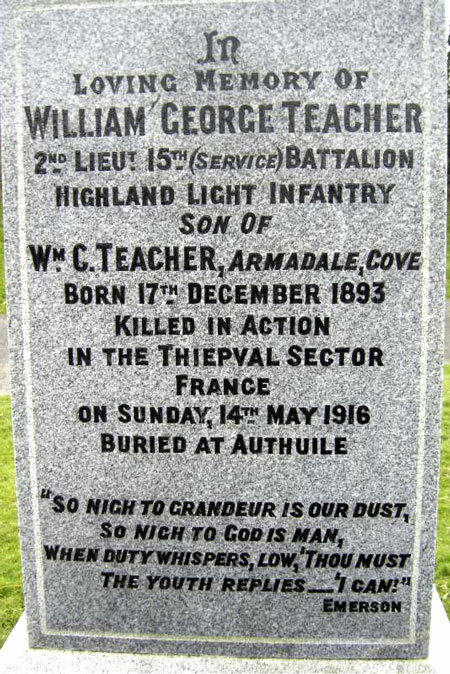 THE GREAT grandson of the founder of Teachers Whisky, a young Army officer from Cove, was killed in action in the Flanders trenches on May 14 1916. Second Lieutenant William George Teacher, who was 22, lost his life while in command of his company at Thiepval, a few weeks before the start of the Somme campaign. The elder son of William Curtis Teacher and his wife Eliza Rowena, of Armadale and later Bellcairn, Cove, and Kilarden, Dowanhill Gardens, Glasgow, he was born in Partick on December 17 1893 and educated at Kelvinside Academy and at Loretto in Edinburgh from 1909-12. He was a prefect at Loretto, a three-quarter and colours winner in the rugby 1st XV for three years, and he gained three silver medals for winning the quarter mile, 100 yards and long jump. He was also a Sergeant in the Officers Training Corps. 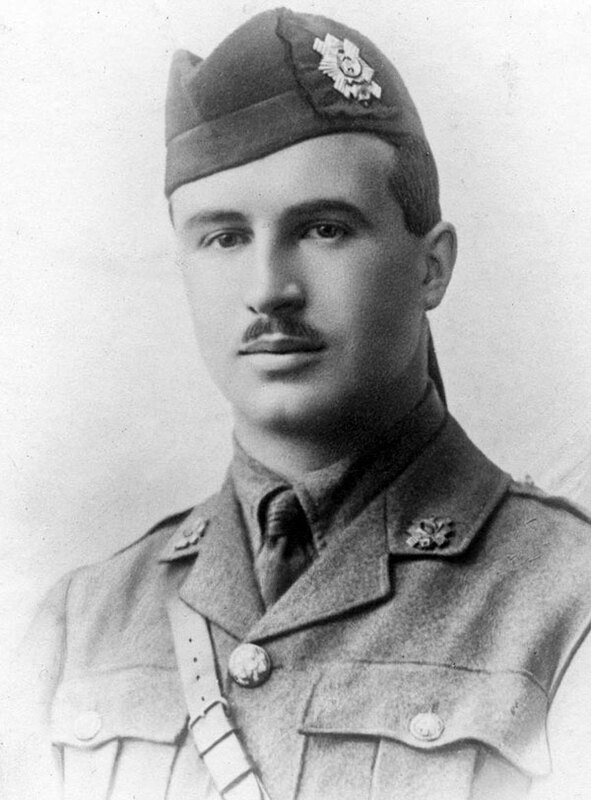 After leaving school he began work at the family firm of distillers, but at the outbreak of war he applied for a commission and was gazetted Second Lieutenant in the 15th Battalion Highland Light Infantry (1st Glasgow) in September 1914. His Battalion went to northern France in November 1915 and was doing a tour of duty in the trenches at Authuile. He was killed while going round his ‘D’ Company front-line trenches. His Platoon Sergeant added: “His cheerfulness in every turmoil, his calmness and coolness in every danger, in all his unrivalled soldierly example has left a stamp on us which I trust will never be effaced. He was buried in the British Cemetery at Authuile Military Cemetery, and he is commemorated on the Cove and Kilcreggan War Memorial, just below the name of his cousin, Flight Lieutenant Alan MacDonald Stevenson. A Memorial Window (right) at Kelvinside Hillhead Church in Glasgow was presented by his parents in memory of their son in 1917. It was designed and created by Messrs Meikle & Sons, and it is emblematic of the triumph of Right and Justice over the powers of Evil. They also presented £2,000 to Craigrownie Parish Church in Cove, with the income going towards the minister’s stipend, in memory of their son and nephew. In 1927 they presented £5,000 to the new radiological department in a Glasgow hospital in memory of the officers. The Teachers Whisky story began in 1830 when William Teacher obtained a license to sell whisky from a grocer’s shop in the Anderston district of Glasgow. The company became known as William Teacher & Sons Ltd and it was their forays into the business of exporting that proved key to the growth of the company. It is currently owned by Suntory Holdings of Japan.